Educational Qualification : SSC with 50% marks and ITI in relevant trades. Eastern Railway Selection Process : Selection will be based on Merit in the both Matriculation & ITI Examination. Application Fee : Candidates have to pay Rs. 100/- through Indian Postal Order drawn in favor of FA & C.A.O., Eastern Railway, Kolkata payable at GPO/ Kolkata. SC/ ST, PH, Women candidates are exempted form fee payment. 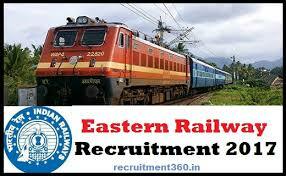 How to Apply Eastern Railway Vacancy : Interested Candidates may apply in prescribed application form along with self attested copies of relevant documents, IPO & envelop superscribed application for the post of “______________” send to Workshop Personnel Officer, Eastern Railway, Liluah, Howrah – 711 204 on or before 07.12.2017.